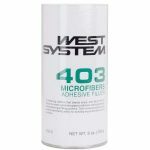 West System 403 Microfibers Adhesive Filler - Goosebay Sawmill and Lumber, Inc.
403 Microfibers, a fine fiber blend, is used as a thickening additive with resin/hardener to create a multi-purpose adhesive, especially for bonding wood. Epoxy thickened with microfibers has good gap-filling qualities while retaining excellent wetting/penetrating capability. It cures to an off-white color.